After laying my hands on the new kindle paper white, i excitedly paid up for the kindle unlimited subscription with the aim to read up everything possible. Though the collection is limited, there are many an interesting books in the collection. 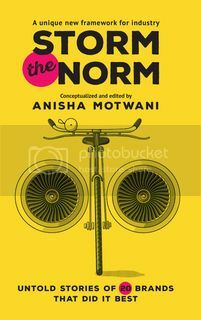 I downloaded the allowed 10 books immediately and got reading “Storming the Norm” by Anisha Motwani this one immediately. Being in the marketing profession, reading up on brands and their evolution seemed to the most obvious thing. The book explores the way top brands are built through the examples of some top brands that have been built in India. The Brands listed here are classified into neat segments and the mix is across industries varying from FMCG, telecom, automotive, etc..
Reading the evolution of each of these brands helps the reader understand and learn how a brand is built on consistent communication of a great product, keeping the media and language relevant to the ages. The book did not live up to the expectations though. The monotony in explaining history of each of the brands seems more like reading up their wiki page, or the company page of these brands and it gives a feel that it is more of a PR pitch sponsored by each of the brands listed here. No negatives are highlighted about any brand and that builds on the suspicion even more. Having said that, the book serves as a good starting point for anyone to read up the history of each of these brands and get a glimpse of the inside workings on building a brand. It is a short book, lacking the depth that i was looking forward to. Maybe further detailing the finer nuances of brand building and the difficult choices faced by the people at the help and the reasoning used to arrive at the decision would have helped build further texture. SÃ¥na gubbar behÃ¶vs det fler av hÃ¤r i vÃ¤rlden. Och vilken bra bild du mÃ¥lar upp med fÃ¥rskit och vedrÃ¶k, man kÃ¤nner att man Ã¤r dÃ¤r.Hos min farmor pÃ¥ landet var det fler smÃ¥ energiska tanter. Och med smÃ¥, sÃ¥ menar jag smÃ¥. Ren i Ã¥e¥ÃÃtrsa¥ldtr hade man vuxit fÃ¶rbi de flesta. De excentriska gubbarna satt instÃ¤ngda pÃ¥ vinden. Kom de ner sÃ¥ sa de inte sÃ¥ mycket. De smÃ¥ tanterna skulle bara ha hÃ¶jt rÃ¶sten.